Fiber Fusion Northwest hosts a great line-up of vendors. ​Vendors of any type of natural fiber or fiber-related products are encouraged to participate! New Vendors who register before May 16th will have their entries returned. ​Please help us keep the processing load down by waiting! We've made updates to the process, rates, times, agreement, etc. So, please read everything carefully. We guarantee the same spot with the same size booth. If you choose to change your booth size, we go by first come, first serve, and availability. 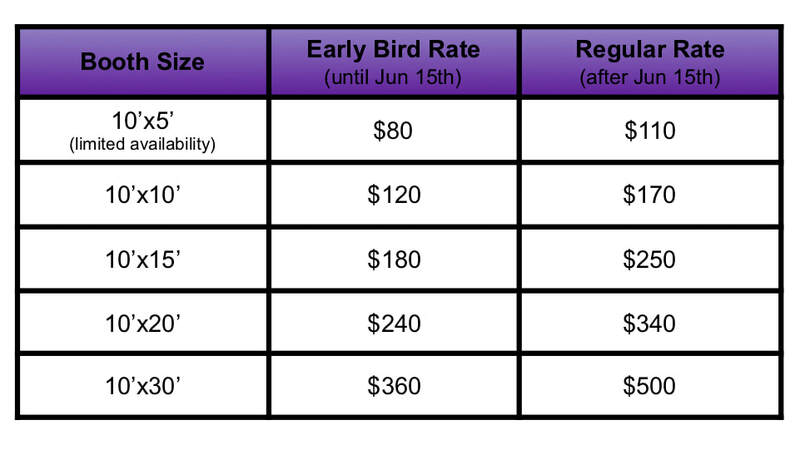 Pricing above is for booth space only and does NOT include table, chairs, or barriers. Wi Fi is available through the fairgrounds. Breakdown of booths must not begin until after 5:00 pm on Sunday. We are offering special rates to vendors on advertisement. Get your logo or picture displayed on the 2019 Vendors page on the Fiber Fusion website for $10. We also have Sponsorship opportunities that may interest you. We are currently looking for interested parties to perform simple, free demonstrations. ​Our goal is to have demonstrations ongoing through the course of the weekend. Note: Please check the website below as we were informed that the rate has changed. Vendor Registration Form AND payment must be submitted in order to reserve a booth. Please select only ONE option!